This is Evan Jordan’s DIY conversion van tiny home. 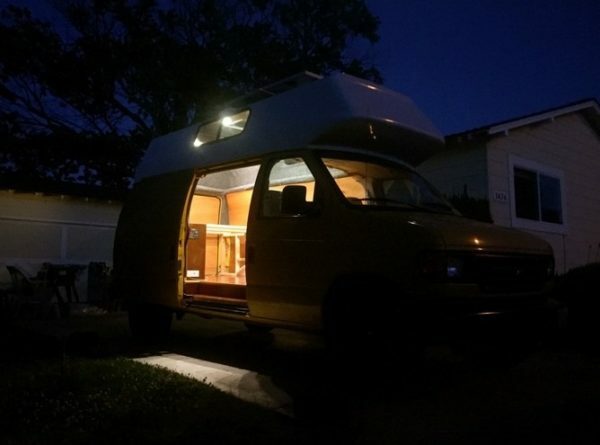 He bought the van on Craigslist, and spent 4 months of nights and weekends converting it after work. This is one of the best van conversions I’ve seen. Please enjoy, learn more, and re-share below. Thank you! You can share this van conversion tiny house story with your friends and family for free using the e-mail and social media re-share buttons below. Thanks. If you enjoyed this van conversion story you’ll absolutely LOVE our Free Daily Tiny House Newsletter with even more! Thank you! I think it is awesome, what a lot of work and great craftmanship…love everything – solar especially. Great job! Really well done. Thanks for the detailed pix. I’m planning my van conversion and this gives me some great ideas. There is nothing like customizing your space to exactly what you want and need. To me an RV is too much stuff and maintenance and gas and a solar powered van is perfect. Who needs a bathroom and shower and all the associated crap when you live in America? I’m even debating a kitchen and whether it’s necessary. To each their own but I’m looking for a clean, safe hotel room on wheels. > Who needs a bathroom and shower and all the associated crap when you live in America? I’m even debating a kitchen and whether it’s necessary. Absolutely! This guy has done a great job but just how big does a bed have to be in such a tiny space? He’s used up about 1/3 of his floorspace unnecessarily. One of the points of going mobile is having an active life; an enormous, space wasting bed is insane. As for the kitchen, more wasted space. All you need is a small sink and counter. Really, the answer is a grid like shelving system that each user customizes as to their needs. I have yet to see this offered by manufacturers. Maybe one day they will wake up. Look at the typical RV. Just a space wasting nightmare packed with low quality crap. Maybe some people go camping for the sole reason of eating and sleeping and relaxing watching movies. I think you can do that at home. It should be about what you are going to do and how much stuff will it accommodate for you. Is that a Coleman stove recessed in the counter? I dig it! Remember, burning fuels such as propane generates enormous amounts of water vapor, so avoid mold by ventilating aggressively. Very nice. I like the idea of cutting out the lower exterior to store the propane in. Don’t care for the yellow color. High-top is definitely the way to go, at least for me (tall). Polyurethane foam insulation…I’ve read that that stuff will off-gas, which should be a concern for such a confined area and the fact that you would spend a bit of time there. A most excellent job Evan!! regarding the stove and the foam insulation giving off gas or water vapor, it looks like Evan has a powered roof vent in the top of the van , so if that is running , it should not be an issue. The foam insulation is the same that is used in home construction for sealing around windows. I would like to know about the fridge. It looks like a small 120 Volt one running off an inverter. Much better than the traditonal RV ones that run off propane and need to be vented outside. I put a small 12 volt DC compressor fridge in my travel trailer , when I did some serious renovations to it. +1 on DC rocker-pump refer/freezer. Efficiency of a 4 cubic foot model is excellent when compared to 120v (even Energy Star models) and doesn’t require an inverter-loss of ~15% typical of sinewave inverter. Solar power Watts are dear, but if your batteries can bulk charge when you drive, non-optimized solar is okay. I would install some hooks for hammock. Lighter/more compact stowed than any bed. Nice job. The solar is a excellent feature. Van homes are getting bigger amongst the younger people these days…the American Dream is changing! A used cargo van (not an RV) is available for a few thousand dollars, giving you a place to live for the cost of maintenance/insurance/tags instead of a $1150 + utilities + parking apartment. Both is frequently not an option. In Portland Oregon, housing is really expensive to buy, but there are jobs that pay, and you are working all the time so you don’t need an apartment. Don’t have pets. You need a big closet to live in, or a van, that costs less than 1/3rd of your income. It doesn’t need a 52″ video screen or a sauna. Get 24-Hour Fitness membership during frequent super-discount offers. The van can go to the beach if you get 2 days off in a row. For the size bed some one who say its to big… but you spend 1/3 of your time there so 1/3 of the space is not so bad ;-). The only concern I have is the not very aerodynamic shape of the extra roof. it will dramaticly increase the fuel consumption. A full-size small block V-8 van is already shaped like a brick and gets 9mpg city and 16 highway with tires correctly-inflated. The increased frontal area is smooth. The trick is to go slow, the minimum safe highway speed in the right lane. Minimizing extra stuff weight in the van before a trip helps. Concept is good, work looks well done. He did a lot of things tho that I would never do. For one, I would never have covered the rear windows, or the window in the sliding door. I would leave those in for safety reasons, sometimes you’re pretty well lost unless you can look out of those areas. And that’s what curtains are for. I don’t know if the toilet is hidden, or just none – a toilet is a necessity, not a luxury. A shower is a luxury, you can always stand in a large pan, and wash with a cloth, not my first choice, but works sufficiently well. Well, it’s his rig, up to him what he wants. But what really irked me is, all the photos, and no explanation of any of what he was doing, or why. Cargo van frequently has side window next to the driver/passenger only- no rear windows. It saves weight and costs less. He could also have just one of those seats, with plastic bags, not luxurious, but doable. The point is, he doesn’t say. Now that I look again, I don’t see anything for heat. And does that propane go to just the cook stove, or what? Like I said, tons of info not passed along. Good idea, he just didn’t run with it. No way to find out how he did certain things? Like the roof? Cost of everything? Etc etc. Details would be great. I really like the way he did this. Awesome job! Great way to travel! Almost all the comforts of home! You don’t have to pay hotel fee’s! Hats off to you! Job well done!!?? Wow, I am so very impressed. Some people just have a gift when it comes to knowing what and how to do things like this. Great job…. love it!! Yes some people certainly do! The foaming insulation is not good, as humidity could cumulate there. Just my opinion, what do you think ? Hi Elie, good point on foam insulation. I think you might be right! What a handsome, intelligent young man! I wish I were that capable! Nice climbing/surfing van!! Holy crap this is dope! Brilliant. I think it was excellent. The solar setup looked very user-friendly also. The only thing I think I’d change would be the counter widths. A little smaller is do-able. Since it’s already there I recommend adding some pull out cutting boards to the counter. It seems like he enjoys cooking. Slide it out for cooking space, clean and slide back in. Really impressed. Yes he must like cooking! Great job well done photos, The bed should be the most important part, the rest is to each his own, I hate negative comments, i’d rather look at my glass 1/2 full than 1/2 empty plse be positive!!!! thanks. I love that attitude 🙂 Yay for positive thinking!